The Russian Su-24 military jet was shot down by a Turkish F-16 over Syrian territory while returning to Khmeimim airbase, the Russian Defense Ministry has confirmed. The Ministry's Twitter says that “analysis of the objective monitoring data” showed the downed SU-24 jet did not violate Turkish air space. Earlier in the day, Russian President Vladimir Putin said he regards the downing of the SU-24 as “a stab in the back” by “terrorist accomplices,” adding that Turkey gets the flow of oil from Islamic State-controlled territories. The SU-24 tactical bomber jet was downed on Tuesday morning after being hit by an air-to-air missile fired from a Turkish F-16 fighter jet. 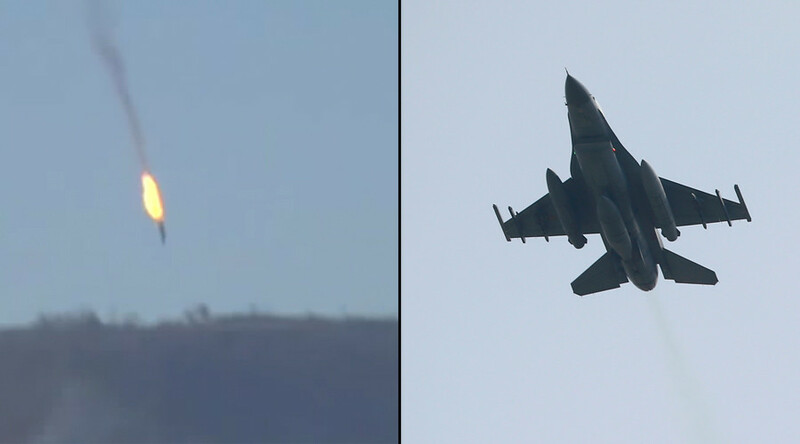 Both pilots managed to eject, but were reportedly shot while parachuting by rebels from the ground. Video footage released by the rebels shortly afterwards shows the dead body of a Russian pilot being inspected by armed men. A Russian air rescue team from Latakia airbase is still airborne searching for the other pilot.